Kazha will be performing at the 2019 Memphis Japan Festival! Founded by Japanese singer/bassist Kazuha Oda and guitarist Hideki Matsushige, Kazha is a rock band based in Memphis and touring the U.S.A., making special guest appearances at anime and comic conventions and festivals. Kazha is also the only band from Japan that is listed on the Top Special Guest List of AnimeCons.com - the most popular Anime Convention directory on the internet. They have also been featured on local broadcasts, such as WREG News Channel 3, ABC 24 News, and WMC Action News 5. In October, 2018, Kazha released their self-titled third album “Kazha”. Representing a new future of music, Kazha is a fusion of cultures and musical view points that create their sound, combining the softness of a falling feather and the heaviness of a hurricane. ​A full day of music, dance, martial arts, ​a roving Japanese Candyman, and Taiko. 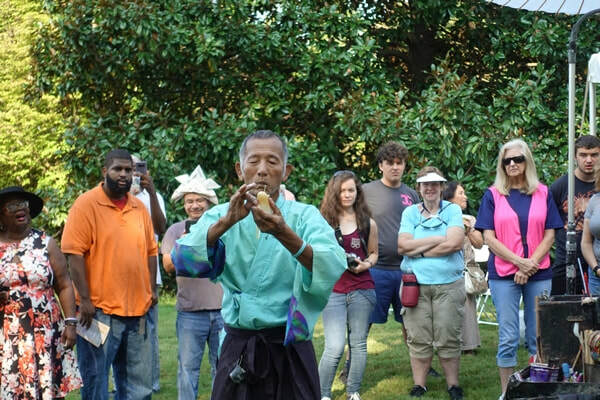 ​​Masaji Terasawa, the Candyman, is coming to the Memphis Japan Festival! The Candyman is a traditional street performer and a one-man-show from Japan. After he moved to the United States, the Candyman began entertaining at Disney World's Epcot Center and now travels to Japanese festivals throughout the country. The Candyman is said to be the only person in the U.S. practicing the ancient Japanese art of amezaiku, sculpting hot taffy into shapes of animals, and he will also keep us entertained with magic tricks and stories. Daikin Taiko Drum Team from Decatur, AL will open the Festival at 10:00 a.m. Daikin is the largest producer of air conditioners in the world. They will perform four times during the day, sharing Japanese culture with taiko drumming and authentic Japanese bon-odori dancing. Be ready to dance with the Daikin group. They love for the audience to join them. The Kent Family Magic Circus is a mixture of circus, theater, and vaudeville, with a sprinkle of side-show. All put on by the Kents, a family of nine that travel and perform all over the United States. Victor Kent received his first magic kit from his grandmother at the age of seven and it wasn’t long before he was entertaining family and friends. Victor and Mami Kent traveled and performed in Japan for several years before returning to the United States and are performing now with their seven wonderfully talented children, all beginning their career in magic at the age of three as magician’s assistants, then moving on to their own area of interest. As you can imagine, this adds a lot of variety and fun to the show! We are excited to welcome our Cosplay Guest, Jaz Hollingsworth, to the Main Stage. Jaz will talk with our emcee, John Gale, about her costume and her character - Kotori - one of the main characters in Love Live! and a valuable member of the popular group, μ's(Muse). She’s responsible for designing and creating the groups costumes and always does her best to keep things positive! Based in Jackson, TN, the students of Fudoshinka Dojo practice the old art of Kenpo Karate. Students of Fudoshinka Dojo put an emphasis of their training on understanding of the art & how to adapt it into modern day confrontations. Memphis Kendo Club practices the art of Japanese Kendo and Iaido. Kendo is the actual physical contact sport with two players attempt to score points on one another by hitting key targets on their opponent’s armour, and Iaido is the study of drawing and cutting with a sword. Naginata originated over 1,000 years ago. It was a powerful weapon against horsemen and foot soldiers alike. The naginata's length and weight made it an efficient weapon against the sword. Naginata today is an art form that teaches etiquette, respect, patience, self-confidence, and self-control.